Just a reminder! Don't forget to redeem that Revlon $5 off mascara coupon that we posted about a while back. 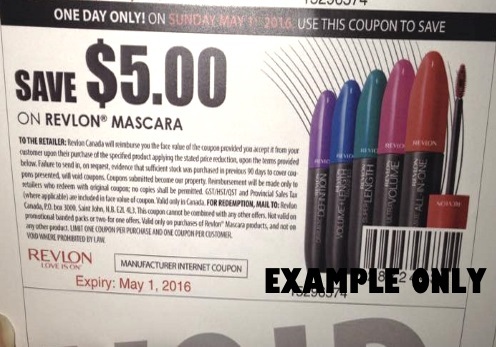 This coupon was from Save.ca and is only valid today, Sunday May 1, 2016. I noticed in the Shoppers Drug Mart flyer the Revlon All In One mascara is on sale for $7.99 each this week! That would make this $2.99 with the coupon, which is pretty good! Click here for the original post about this Revlon $5 off coupon. You can still get this coupon, but it's print only, which works since it's only redeemable today! Did you redeem your coupon? Let us know on our Facebook Page.